Singapore Technologies Electronics Limited (ST Electronics) and SPRING Singapore today announced the four grand prize winners of the Tech Factor Challenge 2016/2017, themed “Ageing-in-Place”, for novel solutions that enhance the safety, health, and mobility of the elderly. The winning solutions include a portable sepsis risk assessment system, a smart home-based medication device, a remote rehabilitation kit, as well as wheel and brake attachments for walking frames. Each of the team won S$25,000, in total constituting a third of the total cash prize of S$300,000. The remaining cash prize will be awarded to the teams upon the successful commercialisation of their solutions. Organised by ST Electronics, held in partnership with SPRING Singapore and supported by SPRING Singapore’s Startup SG Accelerator initiative, Tech Factor Challenge is an annual competition that spurs innovation through the creative application of technology to solve real-world problems. Currently in its third edition, Tech Factor Challenge offers participants the opportunity to translate their ideas into commercially viable prototypes and kick-start their entrepreneurship journey. The winners were selected from 10 finalist teams comprising students, start-ups, engineering enthusiasts and a senior inventor, with prototypes that incorporated technologies such as companion robots with AI-driven interactions and autonomous navigation capabilities, smart medication dispensers, Virtual Reality rehabilitative solution, and smart homes applications. “At ST Electronics, we believe that technology is a key enabler to improve the lives of our elderly. As they enter their golden ageing years, we want them to enjoy and benefit from improved standards of healthcare. As a key player in Singapore’s ICT industry, we are committed to investing in innovation and building up local engineering talents to solve real-world problems, in this instance, for the ageing population. By creating an environment that encourages experimentation and quick prototyping, we hope to discover breakthroughs that can be commercialised in an affordable and timely way to enhance our healthcare for the elderly while seeding the build-up of a silver industry,” said Mr. Tang Kum Chuen, Deputy President of Corporate Development, ST Electronics. Early goal-directed therapy initiated within the first six hours of sepsis diagnosis has been shown to substantially decrease mortality rates. The ground-breaking, intelligent Portable Risk Stratification system assists clinicians in rapid risk stratification for timely clinical intervention. A home-based medication device that aims to improve medication adherence by simplifying medicine sorting, automating medication reminders and monitoring adherence in real-time, empowering the elderly to manage their medication independently. Targeted at post knee surgery patients, the wearable device helps users remotely monitor, track, analyse and report their rehabilitation progress. It provides localised, actionable data and compliance information to clinicians, while motivating users in maintaining workouts, to aid their recovery. Able to be installed in just 10 minutes, they convert existing walkers into wheeled walkers and brake when leaned on for safety, through special braking technology. Elderly are spared from the repetitive efforts of lifting their walkers and are able to get around faster and safely. A total of nine start-ups were incorporated, since the start of this edition of Tech Factor Challenge. To help these start-ups kick-start their innovation process, each team received S$4,000 in seed funding from ST Electronics, attended an experiential workshop to better understand the challenges faced by the elderly, and participated in workshops and mentorship sessions conducted by industry experts. 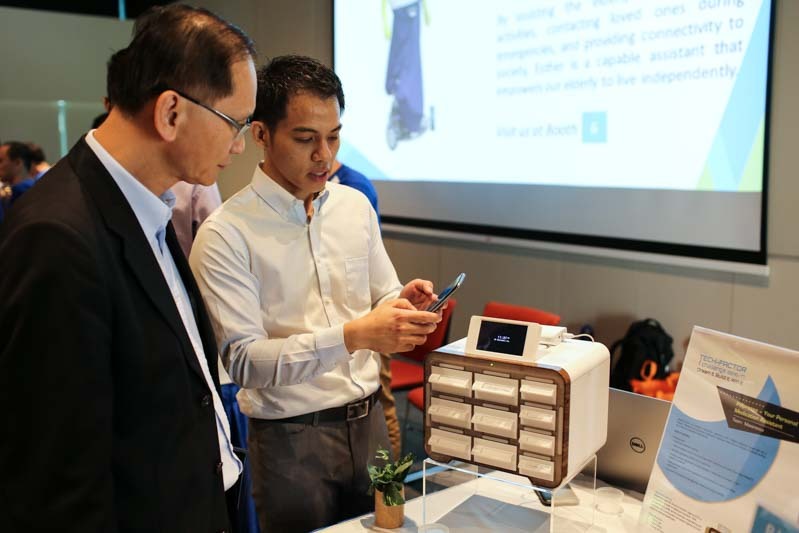 Eligible start-ups were awarded up to S$20,000 of funding support from SPRING Singapore to develop their prototypes with professional prototyping houses. Clinical and technical mentors from healthcare institutions, including ST Electronics, Changi General Hospital, Tan Tock Seng Hospital, Alexandra Health System, and Khoo Teck Puat Hospital, guided and supported the teams through their innovation process. Teams were also provided access to the IMDA PIXEL Labs, using tools needed for their prototype development. They also had the opportunity to testbed their solutions in the Smart Ageing Design Lab at the Centre for Healthcare Assistive and Robotics Technology (CHART), Changi General Hospital, as well as at SG Enable.